October | 2014 | Where's Merrill? If any of your ancestors were raised as Catholics, consider looking for a record of their Confirmation. This holy event is one of the seven sacraments in which Catholics participate as they pass through life. According to Catholic doctrine, in this sacrament participants are sealed with the gift of the Holy Spirit and are strengthened in their Christian life. Traditionally, these days, Confirmation is the third of the three sacraments of Christian initiation (following Baptism and First Holy Communion) normally undertaken when Catholic children are in their early teens. However, in ancient times and still today in some more obscure parts of the world, a younger Catholic child could be “confirmed” prior to Holy Communion, so long as the baptism ceremony had been completed. Fortunately, history dictates that the vast majority of our Irish ancestors were raised as Catholics, so if you have Irish heritage, then extend your vital record search criteria for each Irishman or woman to the following events. A written record of each occasion would have been registered at the time. Recently, I was delighted to find a preserved copy of my Irish grandfather Ned’s Confirmation record held in the custody of his native RC parish church in Tourlestrane, County Sligo. 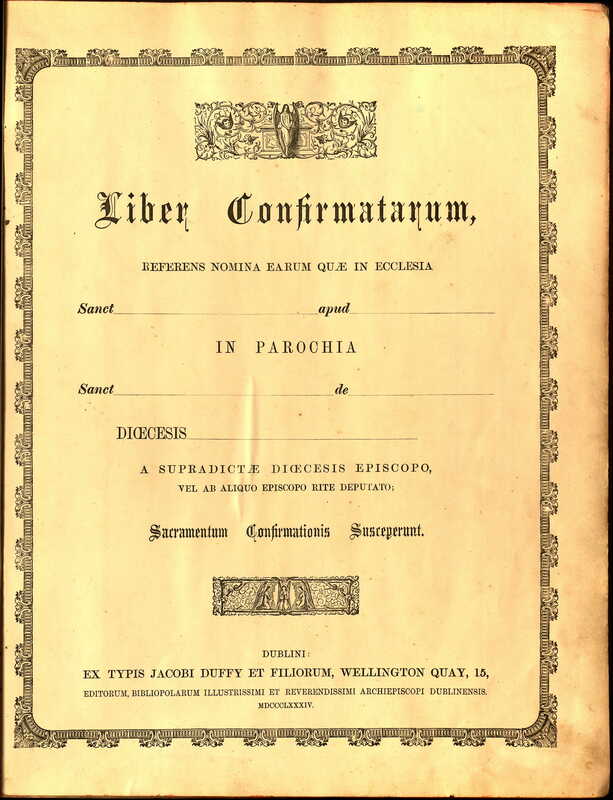 The library in the Parochial House had the usual Baptismal and Marriage Registers but I noticed a smaller section headed Liber Confirmatarum or Confirmation Book. This hand-written register had only been formally kept since the start of the 20th century but this was late enough to include the Confirmation of the 12th and last child of Tom Neary & Kate Stenson born in May 1894. In fact, Ned Neary must have been one of the oldest participants (at age 15) to receive the Bishop’s blessing because the date of the event was May 1909. The poor education of Ned and his parents was displayed by the fact that my grandfather was wrongly registered as a fourteen year-old. Confirmation records are very interesting because they record the full names (and “reported” ages) of all the ancestral children in a generation who lived into their teens. This information may not appear in registered format anywhere else. 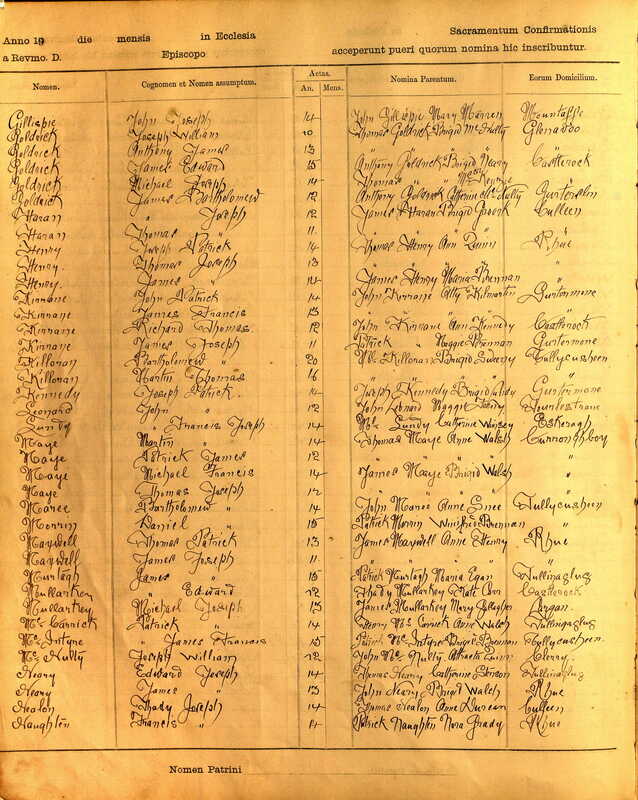 It is easy to detect siblings where the full names and address of each child’s parents were recorded, as shown here. 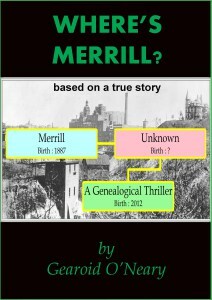 In some instances, the parental data might enlighten or verify your understanding of a mother’s maiden surname which was not forthcoming from other research sources. As part of the Confirmation ceremony, each child is awarded a Confirmation forename which must be an established Catholic saint’s name. My grandfather chose a popular one, Joseph, but the record above is the only document I possess which proves that Edward Neary ever had a middle name. So, 120 years after his birth, my granddad can now be officially referred to as Edward Joseph Neary. Perhaps even more poignant for me was reading the Confirmation record of my granddad’s sister, and the 11th child of Tom & Kate. This was the Neary girl known by the giggle-inducing name of Fanny who no-one could seem to recall. My earlier detective work verified that she was born in April 1892, but she passed away at the age of just 25 in the Sligo Asylum Hospital. Now, at last, funny Fanny had a proper and saintly title. As a young teenager in St Attracta’s RC church, my “lost” great-aunt was blessed with the full name of Fanny Mary Agnes Neary. I am so glad that she chose a female saint’s name. 100 years ago, the vogue at Confirmation time in Ireland seems to have been that boys picked boys’ names, but girls could choose either gender. The Confirmation Book shows many examples of poor ill-advised teen-aged girls choosing new but odd male middle names such as Aloysius or Stanislaus. One last research tip, worth remembering. Our Irish ancestors had a strange tendency of adopting their middle names as alternative new first names in adulthood, particularly if they migrated abroad. When searching for those elusive records featuring your forefathers (and mothers! ), don’t forget that extra Confirmation Name as you fill in the search data box. Then again, I can’t imagine that “Stanislaus Brennan, gender: female” will return many search results … unless she became a nun … but that’s another story for another day. The oldest memorial stone in the graveyards of Kilmactigue parish in south County Sligo commemorates the death of a local resident in the 16th century. The image on the right obviously portrays the more modern recreation of the inscribed obituary of Tadhg Dall Ó hUiginn which can be found at Banada Abbey cemetery. The story behind the premature death of Tadhg (pronounced as Tigue or Ty-g) reveals the perils of being an Irish literary artist in Medieval times. As shown, Tadhg Dall was a renowned Poet and Scholar who was often asked to recite his nationalistic compositions in the courtyards of provincial Irish lords and clan leaders. Tadhg was descended from a family of respected professional poets from the north of the Connacht region in the west of Ireland. He was given the distinguishing middle name of “Dall” because he was blind, and this is the Irish language word for blind. He made his home in the townland of Coolrecuil in Kilmactigue parish. Tadhg’s brother Maol Muire also rose to prominence as an Archbishop of the Tuam Diocese. For centuries, the Ó hUiginn family had been aligned to the O’Conor clan of Sligo, their historical patrons, but by the 1500’s, the O’Hara’s had the upper hand in the south of the county, and Kilmactigue became the O’Hara stronghold. It appears that Tadhg Dall’s bravery in speaking out about the injustice meted out by the ruling O’Hara’s to his fellow parishioners, cost him his life. 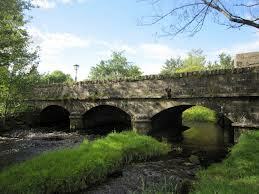 An inquisition held at Ballymote in 1593 recorded that Tadhg Dall had died at Coolrecuil on the last day of March 1591. Many years later, a special chancery inquisition in 1617 provided further details of the circumstances of Tadhg Dall’s untimely death as he entered middle age. The 1617 inquest notes tell us that members of the Ó hEadhra (O’Hara) sept from Cashel Carragh, Kilmacteige, were detained in 1591 for “murdering one Teige Dall O Higgen his wife and childe in the year one thousand five hundred ninetee and one or thereabouts”. Apparently, Tadhg had composed a satirical poem which narrated the actions of six “robbers,” all called O’Hara. The ruling Lord of the Manor was outraged and reacted by ordering that Tadhg Dall’s tongue be cut out. The obedient perpetrators clearly went even further and butchered all the inhabitants of the Ó hUiginn cottage in Coolrecuil. The ancient poetic works of Tadhg Dall and his forefathers were preserved in early 17th century manuscripts created by banished Irish exiles living on mainland Europe. 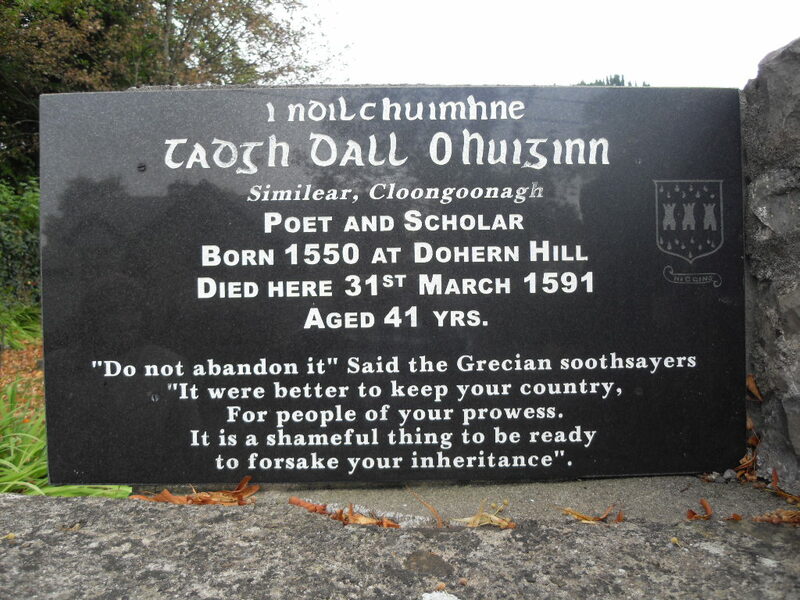 Fortunately, Tadhg Dall’s bloodline was also preserved because his nine year-old son, Tadhg Óg Ó hÚigínn, was absent from his childhood home when the murderous O’Hara gang spilled blood in medieval Coolrecuil. Tadgh Óg’s grandson, Pól Ó hUiginn also became a scholar and preacher of repute, although he defiantly converted to Protestantism after falling out of favour with his Roman Catholic peers. In a perverse way, the gruesome events of 31st March 1591 at Coolrecuil have permitted historians to compile the oldest definitive Family Tree of a non-aristocratic resident of Kilmacteigue parish. 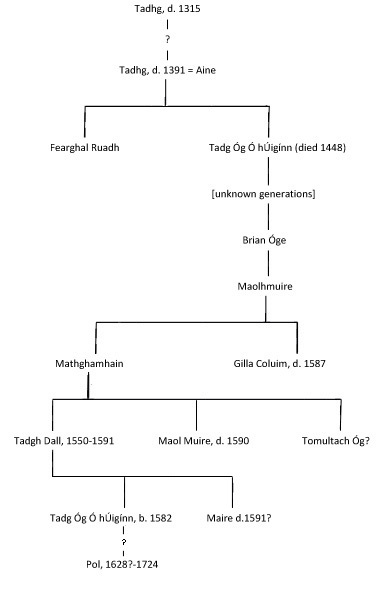 Here is the upper part of the Ó hÚigínn tree covering the pre-18th century years which rarely feature in typical Irish Ancestry research projects. Do you believe in Fairy Stories? Bridget Boland was born at Ballyvadlea, between the towns of Drangan and Cloneen in County Tipperary on 19th February 1867. She was the youngest child and only daughter of Patrick Boland and Bridget Keating. She attended Convent School in Drangan and was later apprenticed to a dressmaker. On 6th August 1887, she married a local cooper [barrel-maker] named Michael Cleary, after which she worked successfully as a dressmaker and egg seller. The couple remained childless and Bridget was recognized to be an unusually independent woman for this era in rural Ireland. After her mother died in 1894, Bridget developed a habit of visiting the so-called fairy forts in the district. Local superstition named such places as haunts of the fey folk. Perhaps Bridget was seeking supernatural help to overcome her infertility. Bridget became severely ill on 6th March 1895. Her headache, fever, and congestion were diagnosed as bronchitis by the local doctor, but family members thought that her lassitude indicated a clear case of fairy stroke. Michael Cleary, in particular, became convinced that his wife’s spirit had been stolen by the fairies. As a consequence, for the next nine days, Bridget was forced to endure the rigours of a secret fairy trial. Bridget’s family and neighbors confined her to the house, and then doused her with urine and hens’ dung to keep the evil fairies away. Next, Bridget was force-fed all manner of odious potions and dry herbs. At the peak of the “trial,” Michael scarred his sickly wife with red-hot fire brands in an effort to force the occupying fairy within Bridget to release her good spirits, and enable her to make a recovery. The wicked fairy was not to be overpowered, and retaliated by weakening Bridget even more. In the predawn hours of March 16th, Bridget was dressed in her best clothes and taken before the hearth where her husband doused her with lamp oil and burned her to death. Bridget’s body was then wrapped in a sheet and buried in a shallow grave in a bog ditch little more than 1000 yards from the Cleary cottage. 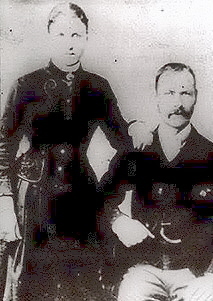 The body was discovered five days later and a coroner’s inquest was held. Nine of Bridget’s family members were arrested on charges of murder. The subsequent trial became a religious and political showcase in which different parties attempted to quash potential Home Rule for Ireland by denigrating the whole population as superstitious primitives. Prominent Catholic churchmen who attempted to defend the actions of a grief-stricken family were duly rounded on and made a laughing stock as supporters of supernatural nonsense. “What is the difference in believing in God and his angels, as opposed to the Devil and his demonic fairies?” This was the national argument in the Spring of 1895. In the end, Michael Cleary was convicted of manslaughter and served fifteen years of his twenty year sentence at hard labor. Bridget’s elderly father, Patrick Boland, served six months hard labor. Several cousins and an uncle of the deceased also served sentences between three to five years. 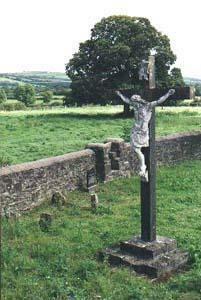 Bridget’s body, unclaimed by her incarcerated kin, and untouched by the local RC church reluctant to associate themselves with a scandal so steeped in superstition, was quietly buried one evening by two constables just outside the churchyard wall at the Drangan and Cloneen Parish Church, not far from her mother’s grave within the Holy Cemetery. In former days there was no bridge at Aclare but a ford with large stepping stones across the river, and when flooded the people had to throw a plank across those stones to get across the opposite side of the river. In them days there were three brothers of the name of O’Hara. Their place of residence were in three castles, two of which are in this parish and the third in the parish of Achonry, namely Ballyara Castle. The Kilmacteige castles were at Bellaclare and Castle Rock. The eldest brother was Clare O’Hara who lived in Bellaclare (Belclare) Castle. A in Irish is “a ford,” and the Christian name of O’Hara being Clare, A and Clare joined together to make Aclare, being the name and true origin of this market village.